At the risk of being pigeonholed as Liberty.me’s resident privacy whacko / tinfoil hat guy, I wanted to let everyone know who may be affected that TrueCrypt’s developers have announced that it is not secure. Looks like we won’t have to wait for the complete audit results after all. Due to the abrupt nature of the announcement and the complete lack of details, I have to wonder if the devs were served with a secret warrant from a FISA Court, forcing them to compromise the product without revealing the circumstances. I know they’re suggesting Bitlocker as an alternative, but I’d rather not use a Microsoft product. Does anyone have any other suggestions? For a whole disk encryption, and I always would advise to do a whole disk encryption , there is not much of a choice, when on Windows. The only closed source that somehow seems to be ok is PGP Whole Disk Encryption. Now owned by Symantec. Downside, aside from the hefty price tag, is that you have to trust an American company and a closed source product. Only open source Windows Software besides Truecrypt seems Diskcryptor (https://diskcryptor.net/wiki/Main_Page). Downside is that this is a small project. Only one developer. I prefer it when many people check the source code. Especially when cryptography is involved. In addition, Windows 8 is not really supported. New GPT HDD Boot Sector Technology vs old MBR Technology Problem. Truecrypt had the same problem. GPT is a nightmare for whole disk encryption software. Honi soit qui mal y pense. However, I would try Diskcryptor. Maybe this is the time where Diskcryptor grows. I hope that someone will take the source code of Truecrypt and continues the project. Outside the states. Preferable in Iceland or New Zealand. We definitely need this, and the fall of TC leaves a giant whole. I think that is the whole point behind the takedown of TC. Thanks for the info! I use linux mainly, but still use TrueCrypt when I boot into windows. 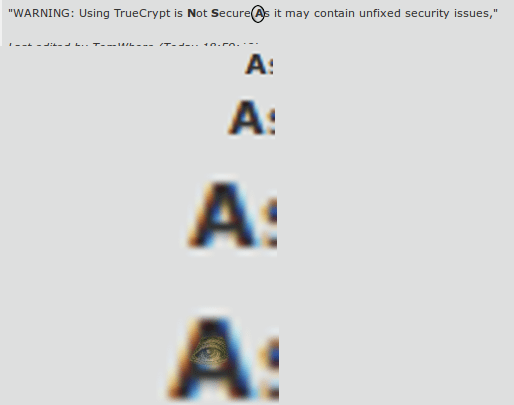 There are forks of TrueCrypt. There’s one for BSD called TC something. I don’t know about Windows. Based on the phenomenal response of that audit, I bet someone will take up the gauntlet and fork it and improve it or we’ll see a similar equally functional successor emerge soon. Bruce Schneier- TrueCrypt WTF includes links to several articles on the story. I think it is too early to speculate on what exactly occurred or whether TC has been compromised. The most logical explanation to me seems to be a simple end of updates by the previous devs. Considering that there hadn’t been an update in two years prior to the questionable 7.2 release with the odd GPL license, it seems likely that we will either find new “management” or a split in the near future. I’d say wait for the audit to complete and make further decisions at that point. I’m not sayin’…but I’m just sayin’. The most likely explanation for this announcement is that the TrueCrypt development team simply no longer wanted to support TrueCrypt and did not handle the messaging very well. An NSL would be difficult given the open source nature of TrueCrypt. If I were into conspiracy theories, I would guess that TrueCrypt was a DOD-sponsored project (like Tor, etc), and some bureaucrat noticed that Snowden used it and shut down the funding. My advice is to keep using TrueCrypt until a better alternative comes along. There is a good chance the project will be forked and adopted by another team. Are you trying to suggest that Tor is a DoD program? Perhaps you are referring to the large chunk of change the Tor Project received a couple of years ago from DoD. I find this more ironic than insidious. If we are to believe anything which came from the Snowden leaks, Tor continues to be an excellent tool to thwart surveillance. > Are you trying to suggest that Tor is a DoD program? I am not familiar with the details, but in addition to that, there have been rumors than key Tor servers are run by the Navy/DoD. I don’t know the details, but the State department has programs to support “democratic movements” via programs like Tor, TrueCrypt, etc. It doesn’t make these tools bad or suspect per se. I wouldn’t use Tor for anything I wouldn’t want the NSA to find out though. Assuming that you both encrypt and utilize Tor, the potential for your information to be decrypted and read is very minute. As Josh mentioned, unencrypted data is vulnerable on the exit side. However, in order to decrypt data, all of the exit relays must be controlled and this is highly improbable. I don’t recall the exact terminology they used, but the NSA mentioned that Tor is essentially a thorn in their side because the technical hurdles are damn near impossible to overcome. There are a growing number of malicious exit relays on tor. It’s important to keep the project viable by contributing bandwidth or contributing a few dollars to those that run servers. More nodes are always helpful, but exit relays are especially needed, though they carry extra risk for the host.